Flashback Part 6: Thirteen chapters in, and we finally planeswalk. Destination: Kamigawa. 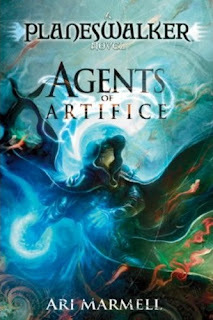 Standard operating procedure: Jace gets called into the Paldor's office, sees who he's partnered with, is given his assignment, and off they go. But this time we have a problem, he's to be paired with the hot-headed Baltrice. He protests that he'd rather be paired with some new name, Ireena, or Gemreth, or anyone else. But despite his protests, there's no choice. Besides it not being up to him, this mission requires planeswalkers, and they're the two available. They're going to Kamigawa. The Situation: A village of ratmen, aka nezumi, live upon some mana rich swamps that the eldest son of the village elder is happy to offer as a mana source for the right price... but his father is not. Kamigawa's mana isn't the most readily available, thanks the living having to share it with the spirits of that world, and this mana would be a great benefit to the Kamigawa cell of the Consortium. The Mission: Jace will confirm the tribal prince is telling the truth, and Baltrice will eliminate the chieftain. They have the night to set and prepare. It's time to walk. Jace has never been there, so Baltrice will lead the way. Jace took a deep breath. "Then let's go." She turned without another word and left to find her own solitude, leaving him to his concentrations. He never knew how it looked to any other walker, how it felt, how it rippled through mind, body, soul, rigid past, uncertain future. He knew only that his own experience was as unique to him as the deepest meaning of his forgotten dreams. He feels his Spark ignite the mana he had gathered, he waves his hand to move a curtain that wasn't there, and then he literally walks through it into the Blind Eternities. In a state of chaos and nothing, Jace follows the remnants of what is a path in a place that has no direction. After an immeasurable amount of time, Jace sees what he understands to be Baltrice exit the Blind Eternities, and he opens his curtain and walks through. They appear in a swampy area near the base of a mountain. A perfect place to walk to. The water is pure enough, with enough life, that Jace can draw small amounts of mana to recover, while Baltrice can draw upon the red. However Jace immediately senses the kami within also drawing upon the same sources and he treads carefully so as not to invite their anger. They're likely forty to fifty miles from their destination, which Jace is thankful for. A day or two to rest and recuperate from planeswalking would aid them before they have to execute on their mission. Jace sleeps, and Baltrice rages. It would be so easy to kill him now. This man whose ambitions are unknown to her. This mind-reader whose talents are nearly one of a kind, while her expertise at death is nearly without equal, it could still be replaced. She could say he never appeared on Kamigawa, got lost finding his way to a new plane. She could say he was killed during the mission. She could say a number of things that wouldn't be unbelievable. But she let her rage burn on internally until she gained control. For as much as she hated Jace, she would not let the mission fail. He might be needed. There was always another time to do the deed. Jace and Baltrice lay hidden and watch the village. They watch for hours and hours seeing no discernible opportunity to sneak in. Day or night, the village was full of activity. Light wasn't something these nezumi needed in abundance to go about their daily activities. Eventually Jace cloaks himself in invisibility and walks among the villagers with a simple spell to understand the meaning of foreign words. It a variety of spell that seems to come easily to all with the Planeswalker Spark. He returns to Baltrice and tells her he didn't learn much besides what they already observed: The village never sleeps and there would be no good time to eliminate the chieftain undiscovered. Everything they were told by the tribal prince is wrong. They're being set up.Jace wants to leave and report back. Baltrice has another plan. There is only one way to deal with betrayal. What Was Their Intel Again? If you're a bit confused, that's because so am I. Did I miss exactly what their intel was? I don't remember them ever being told it would be a cakewalk until the moment the book tells me this isn't how things are supposed to be. Seems like this could have been setup better, we should have been told right away that they were told there would be "minimum impediments" as they were assigned their mission, and not when Baltrice curses that the information was wrong, yet all we were told is that the prince said his shamans would be able to hold the kami at bay as they made their connections to the land. I got one of the answers I was searching for. How doesn't planeswalking work. Understanding this characteristic that sets our hero in this book, and other books to come, is something critical to understand. And I'm glad to see exactly how draining it is on both of them. If they could planeswalk just as easily as breathing, then I would always be wondering why they don't just planeswalk whenever they were in danger. But it seems to take intense concentration and a gathering of mana, and the recovery time is certainly substantial. Trapping our heroes in a maze with no way out still wouldn't make sense, but this is still something that seems manageable. Something to note is the new name that was mentioned. This isn't the type of book that throws out name after name after name to make the world feel populated. The paragraph could have worked just as well only mentioning Gemreth by name. What is her role in this I wonder? Seems like Baltrice is going to be a key figure into why Jace leaves the Consortium... or her actions coming up are too much for Jace and he openly opposes her. Either that or she'll be showing up soon after we return to the present ready to pick up where the hired gun, Semner, left off. But where does Liliana Vess come in? A Consortium member yet to be revealed? Or someone he and/or Kallist run into after their departure?